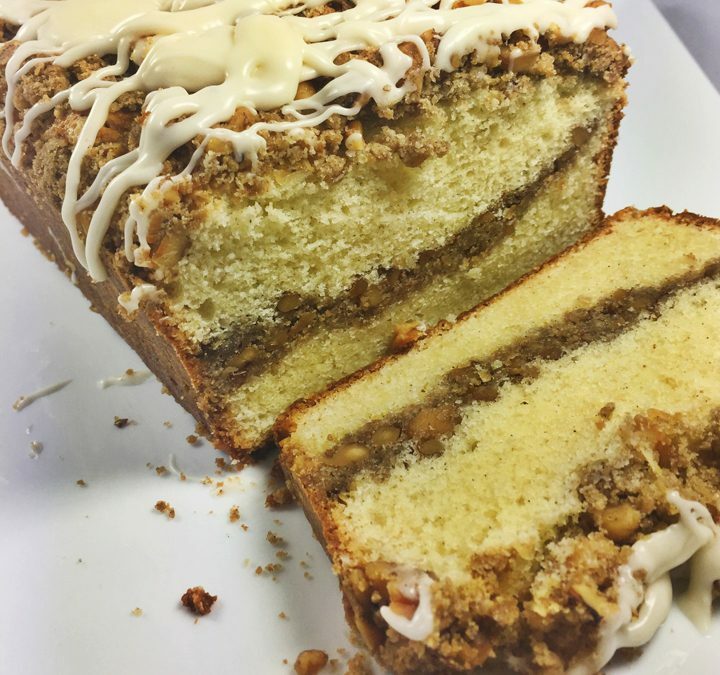 Perfect for a spring breakfast, brunch, or dessert, our Sour Cream and Cardamom Quick Bread is swirled inside and topped with a delicious Walnut Streusel. Moist and delicious, you can also bake the bread in cute mini loaf pans to give as gifts. Remember to avoid over mixing the batter; combine until the dry ingredients are just moistened. Be sure to bake in the center of a preheated oven and test for doneness by inserting a wooden pick into the center of the loaf. This quick bread freezes well, so you can bake ahead and wrap tightly in foil before freezing. Preheat the oven to 350 degrees. Grease an 8″x4″ loaf pan with softened butter. Then line the bottom and 8″ sides with one long piece of parchment paper. Be sure to have the paper long enough to hanging over the edges to help remove the loaf from the pan. Grease the parchment then flour the inside of the pan. Cream the butter and sugar in the bowl of an electric mixer fitted with the paddle attachment until light and all the sugar has dissolved into the butter. Add the egg and egg yolk, one at a time, then add the vanilla and sour cream. In a large bowl, combine the flour, baking powder, cardamom, baking soda, and salt. Turn the mixer to low and add the flour mixture to the batter, mixing until just combined. Remove the bowl from the mixer and stir the batter once or twice with a spatula to assure all ingredients are combined. To make the cardamom streusel, in another bowl, add the brown sugar, flour, cardamom, salt, and butter. Using your fingers, cut in the butter until it forms a crumble. Insert the walnuts and combine. Spoon half the batter into the pan and spread it out with an offset spatula. Sprinkle with 1/2 of the streusel. Spoon the rest of the batter in the pan, spread it evenly again, and add the remaining streusel on top. Place in the oven and bake for 50 to 60 minutes, until a cake tester comes out clean. Let cool on a wire rack for at 10 minutes. Run a knife around the sides without parchment and using the excess parchment, carefully lift the cake out. Remove all the parchment paper and cool completely on a rack. Whisk the confectioners’ sugar and egg white powder. Add the vanilla and milk together, then whisk in the sugar/ egg white powder to make a thick icing. Using a fork, drizzle over the loaf. Let the icing set and serve.